As a modder of weapons, skins and sight, I am making this post to give out my mods to the people of Ace of Spades. I wont go on saying "Im the best modder ever", I'll let the users tell me just how good I am. Feedback is always welcome, good or bad. All it will do is help me improve! I can make blocky and Call of Duty grade sights - hoping the appropriate materials are available. PM or post a request with link to a picture preferably and I will get on it right away. If the queue gets too big I may have to deny requests so I can catch up again, but rest assured you will get what you want. This is what I have so far but I will add more as I please or upload requested models I believe are worthy of giving to the public. Guns, skins and sights. I make them. 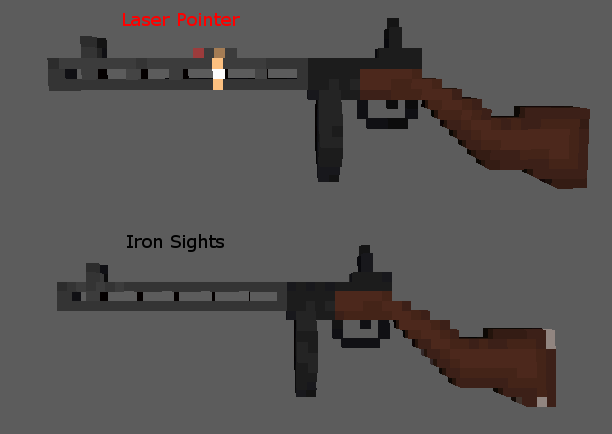 I lol'd at "PPSh taped on a laser pointer" in the imgur link of the sights..
Actually you *can* make laser pointers, as long as the laser is not longer than the barrel of the gun. For an example check my G36C. I know the rules mate.